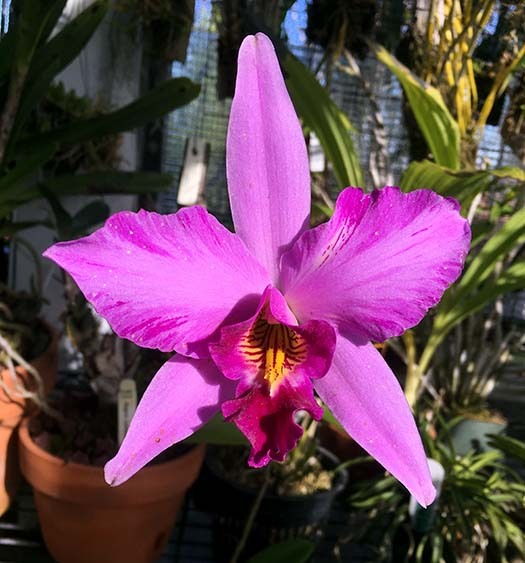 Here is my Cattleya percivaliana. It is much to big to transport, so I am glad that I can share it here. It grows outside all year round in my yard in the inland empire (close to Ontario) and is mounted on a branch/log somewhere underneath all those roots. It has survived temps from 35 to 115 hanging high in my growing area underneath shade cloth. I try to water as frequently as I can, but I know it always wants more. There are several plastic containers of nutricote that are buried in the growths to provide fertilizer all year round. There's a log in there somewhere! 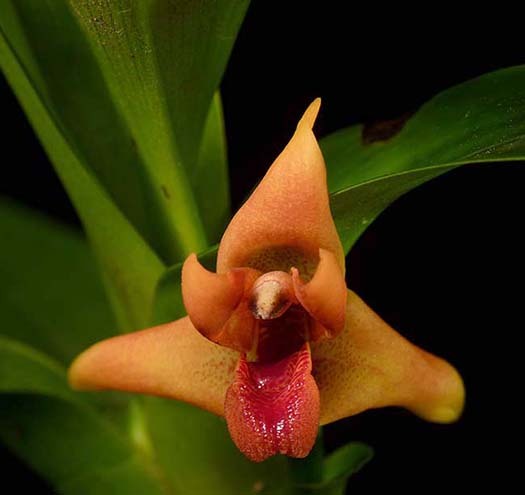 I collected this plant in Belize in 2001, but only just found out what it was. 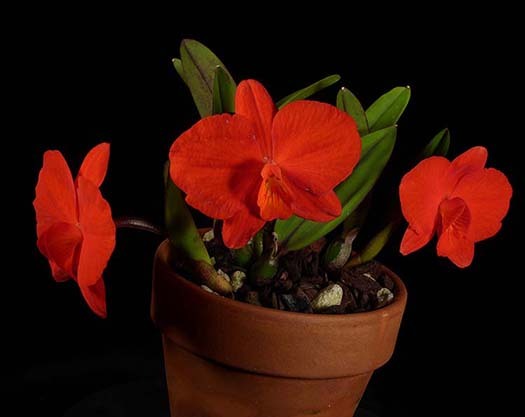 (When I got it, it was mislabeled as Isochilus linearis, which it clearly isn't) I totally abuse it... I repotted it last in 2014. It's in my unheated, uncooled greenhouse on the western side. I water it when I think about it and it sits in a tray of water after I water. 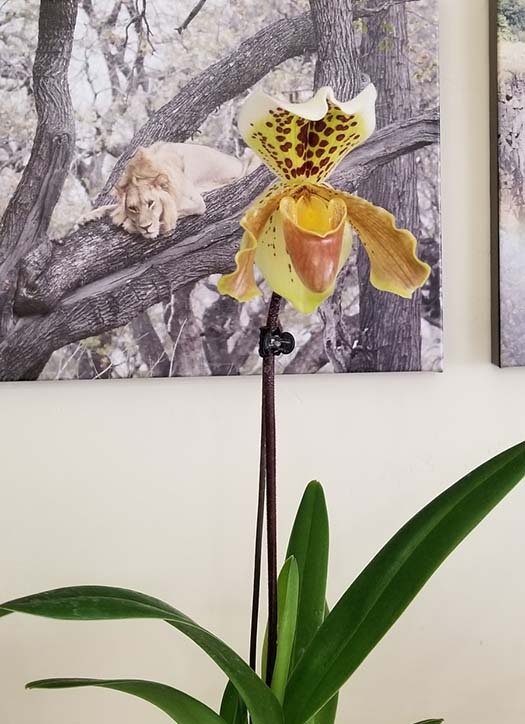 I can't say I take good care of it, but it's an interesting bloom. I received this as gift from Ed Wise in 2007. She blooms robustly almost every year. She is always noticed on the plant show 'n tell. Even Harold Koopowitz bought a piece of it from me. I have had this in my unheated greenhouse for several years, a space consideration, moistly but also protection when I travel. I've been using the "gravel in a basket" method, with drainage holes about 1/2 inchor so up the sides, similar to what speaker Tanya Lam discussed at our meeting several months ago. All of my paphs get that culture, it works for traveling. I use a repurposed plastic container and punch holes about half inch or so up the sides with an ice pick, than place about half inch of gravel in the container. A plastic tub (99 cent store) with open holes up the sides does the same thing, but larger so it will hold several pots. The result is that after watering, a small amount of water remains below the gravel and slowly evaporates. 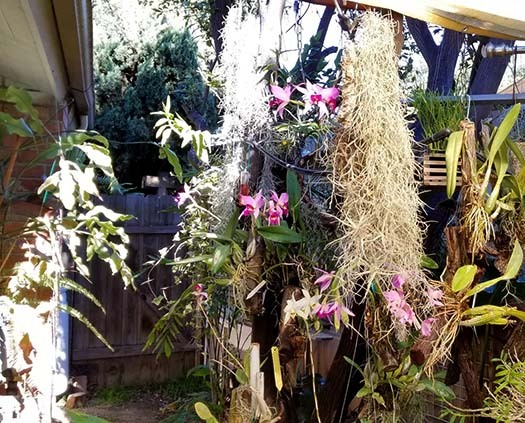 Plants that prefer to dry out between watering shouldn't be in this method. I also attach a gravel pot to a hanging Vanda with wire. A few roots mingle in the damp gravel till the next watering. It's outdoors year round. Sobralias as a Roadside Weed? 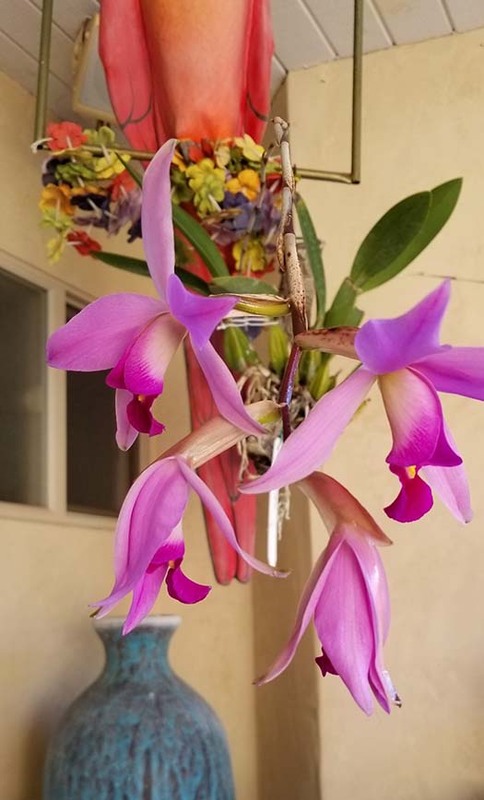 I love growing Sobralias outside here in Southern California, and delight when they produce their large but short-lived flowers throughout the summer months. I fret over the potting mix, and whether to treat them as a terrestrial or epiphyte. I had the pleasure visiting Costa Rica’s Monteverde cloud forest over the New Year and here are a few notes on seeing Sobralias on the road to the park. Moisture from the Caribbean side of Costa Rica is dumped as rain on the East Coast and it becomes a cloudy mist as it goes over the top of the volcanic mountain range that forms the spine of Central America. 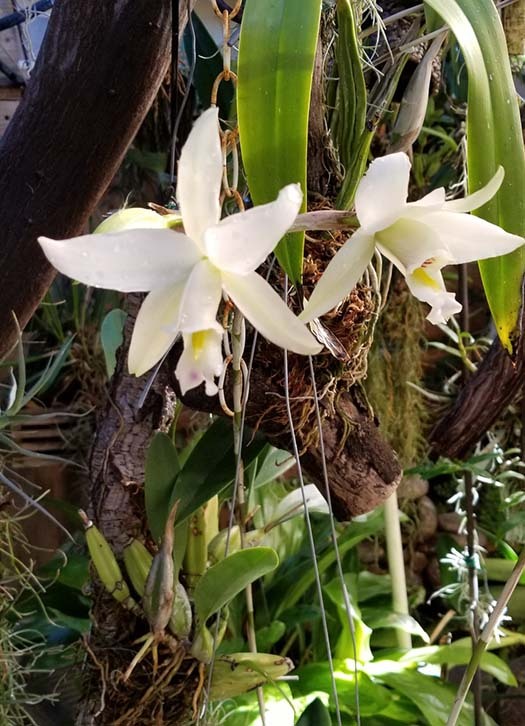 The top of that range is “orchid heaven” and Costa Rica’s national parks claim the highest orchid species diversity as a result. The winding dirt road up to Costa Rica’s Monteverde cloud forest from Guanacaste (West Coast) is wild ride through multiple climate zones. The coastal area, up through 1000 meters or so is hot and dry, as it rarely rains in the months of November through March. There are no epiphytes at all on the trees. Once you get above 1500 meters though, the scenery greens up and thing come alive. You can see the mist coming over the tops of the hills and the orchids love it. Suddenly there is moss everywhere and more Masdevallias and Pleurothallids than you can count (or identify). 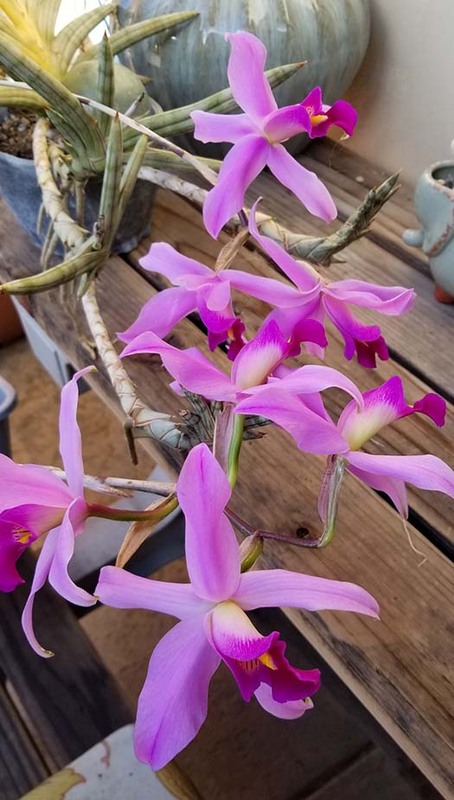 My favorites were the Sobralias though—even though the flowers only last a day before they fade or are shredded by the constant wind. The large, colorful flowers put everything else to shame. 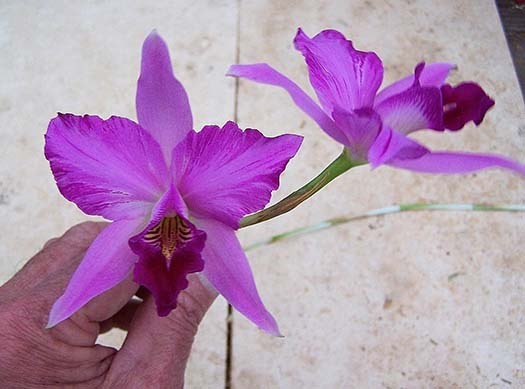 The pics are Sobralia warscewiczii, with variable flower colors, growing both as a terrestrial and as an epiphyte. 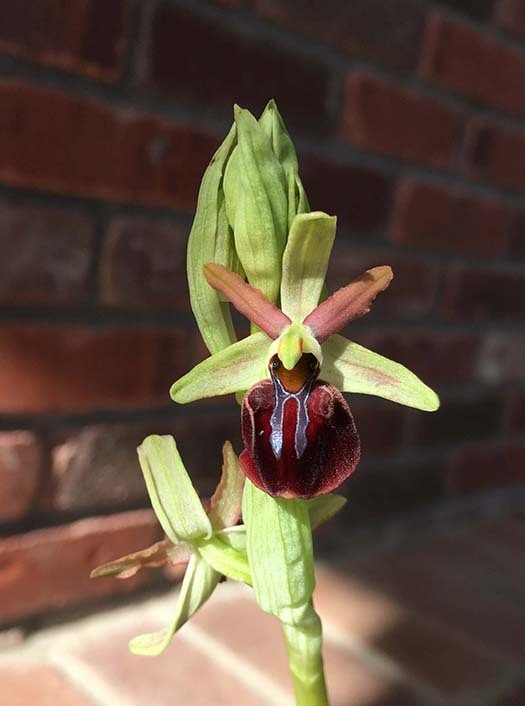 Here’s a large plant of a tiny, slow-growing Vandaceous species from the highlands in Vietnam that does very well outdoors here in Southern CA. One of my plants blooms in the fall, but this one seems to prefer winter. The flowers are crystalline and long-lasting. 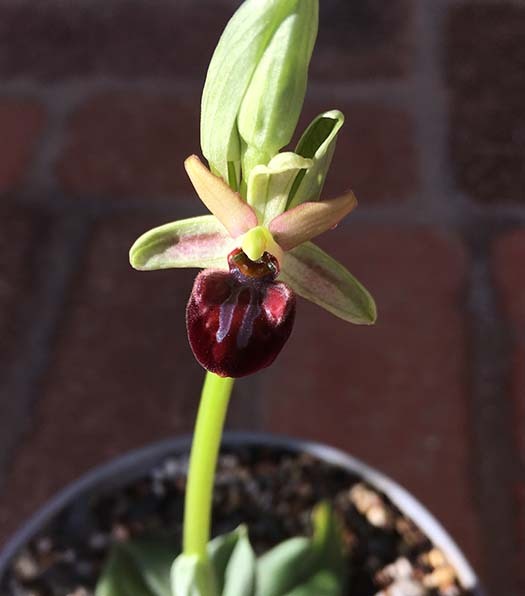 The first of my terrestrials to bloom. It's tricky to photograph, to capture the iridescence, unless it is in full sun and you are almost exactly on the angle the sun is coming from! It grows best mounted, bright but cool (i.e. outside grower). I find Porroglossums more forgiving than some other Pleurothallids, e.g. 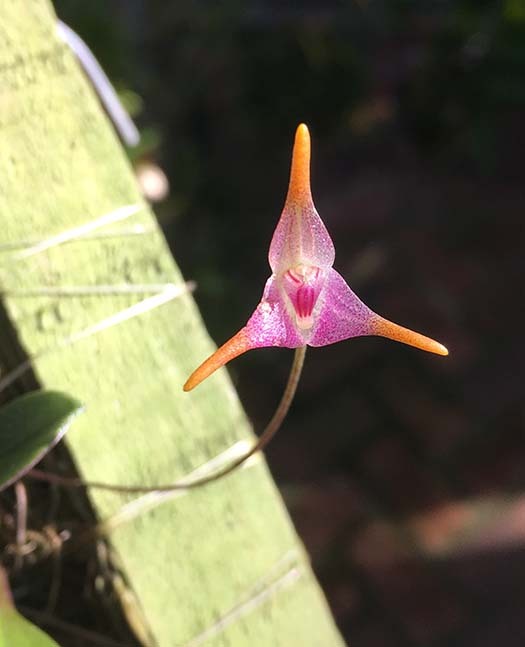 Masdevallia, and their flowers have an unusual mobile/rocking lip. Just getting going... we'll revisit this next month. 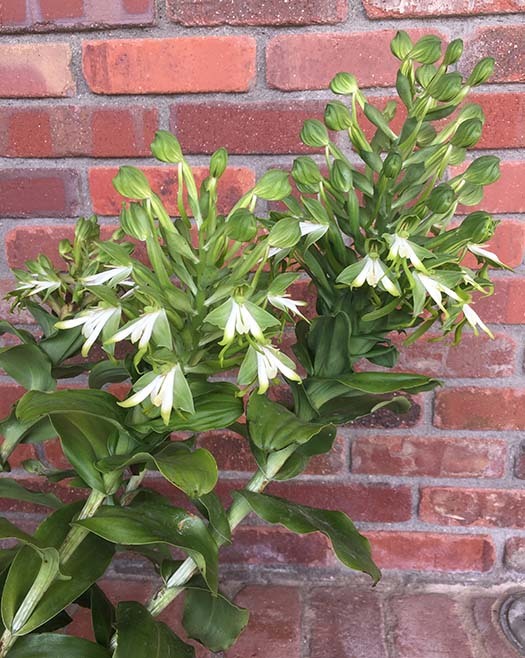 It has 5 spikes, many flowers yet to open. About half of the buds open. Perhaps next month we'll see with all of them. Shown last month in close-up, this is the whole plant, blooming again. 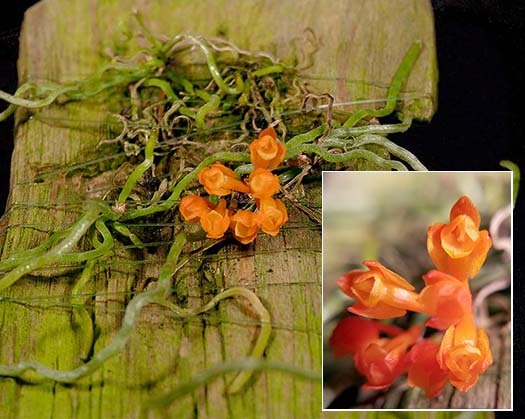 My typical Mediocalcar decoratum is also blooming again. These are all grown outdoors. 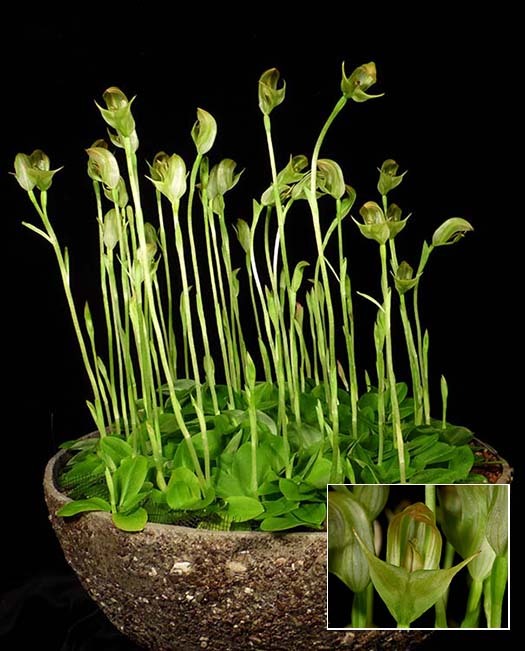 Grows outside in bright shade. It gets RO water - the species is notorious for demanding good water. It blooms at least twice a year. 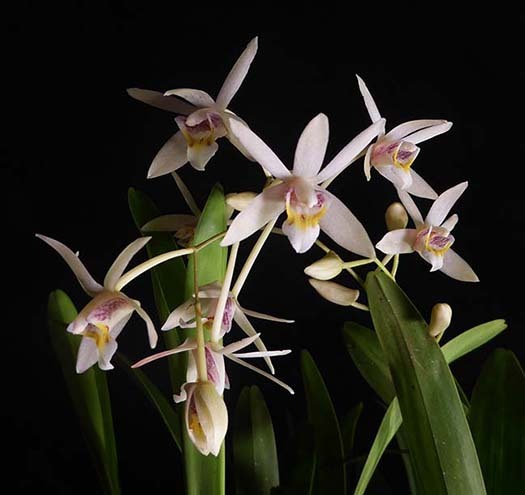 This plant is a tetraploid - flowers larger than the typical diploid. Flowers are long-lasting, and take several days after opening to reach their full size. 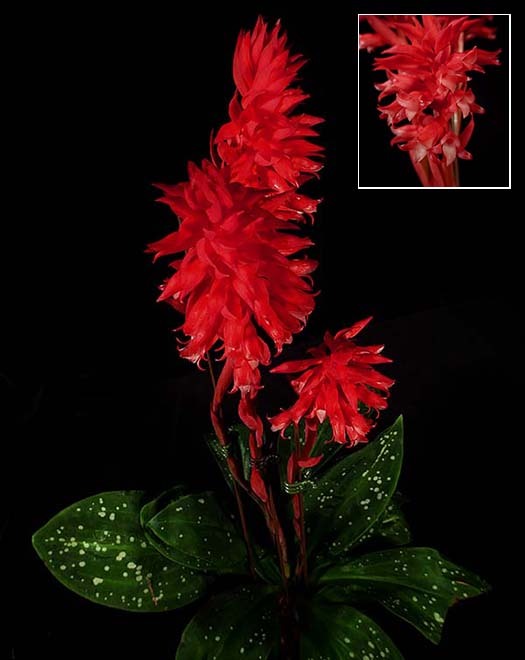 Grows easily outside with filtered sun or bright shade. It happily climbs outside of its basket and just keeps getting more floriferous. It is quite fragrant. This was a $7.50 special that done very well. Outside, fairly shady. 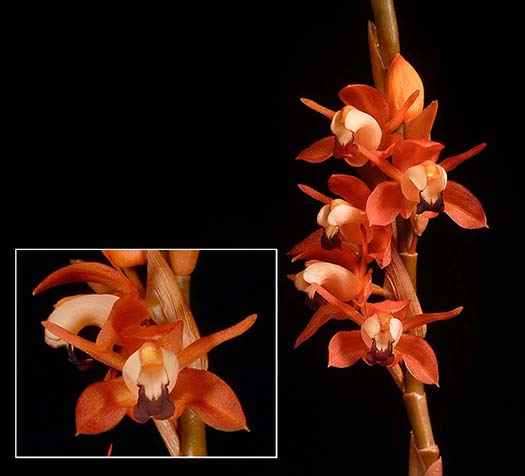 An inflorescence can rebloom the following year, so don't cut an old spike after the flowers drop, until it is brown and crispy all the way down. At least in my yard, the leaves tend to die back even as the infloresence is developing. So far that does not seem to be harming the plant - the new growth emerges at about the same time. This species comes Yunnan Province in China, and also in mountains of northern Myanmar and Vietnam. Listed by Kew as a synonym for Coel. ecarinata. It may or may not be distinct. Outside, shady and damp. This vandaceous species grows around and off the mount - the roots basically ramble freely. Flowers remnd me of tiny Wisteria. Outside, bright shade. This plant is a climber. I positioned a flat piece of hapu'u (tree fern) behind the main growth, held in place with a stake. It seems to prefer a pot rather than basket. There is also a basal growth. The buds suddenly appear peeking out from leaf axils. Flower is about 1 inch across, with heavy substance. Flowers are about 3/8 inch. 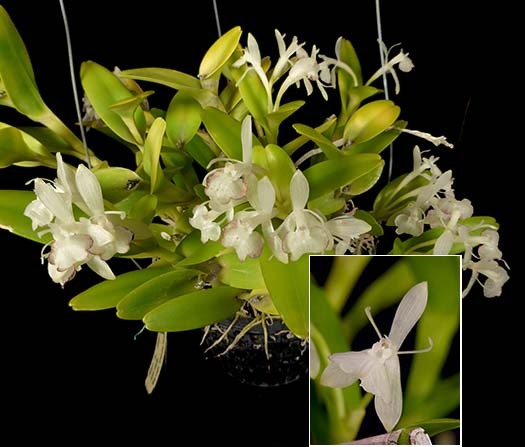 It pops the occasional flower at frequent intervals, a few times during the year one gets a flush bloom. This one grows on the shady side, in a basket. The new growths extend well beyond the basket. Prolific outdoor grower, in basket or mounted. 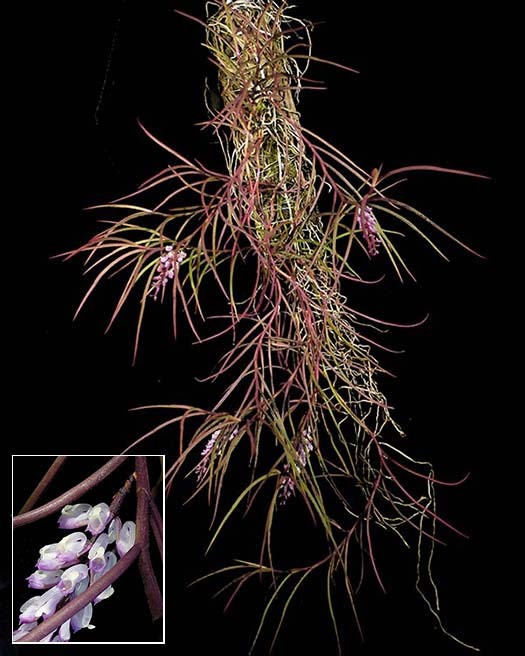 It is a ramblier, with new growths being produced along multiple rhizomes. 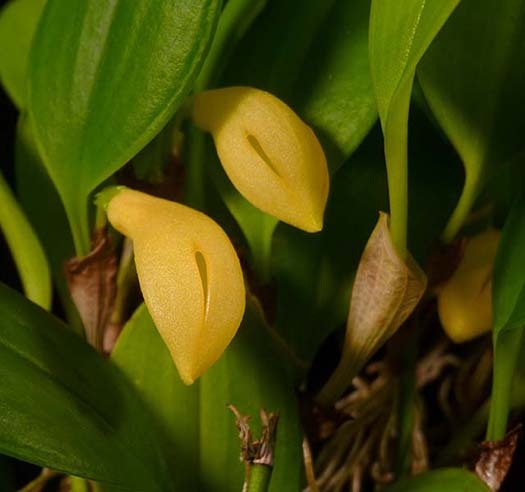 Its growth habit is reminiscent of a Maxillaria or a Bulbophyllum, but it is actually related to Dendrobium. It's that time of year! These go dormant by April or May. I repot and start watering somewhere between July 15 and August 1, increasing watering when I see the rosettes emerge 6-8 weeks later. Ron Parsons suggests that they benefit from a little water during the dormant period (I have been giving none) but I'm not sure that I want MORE of these that I might get with more ideal culture, since they at least double every year. 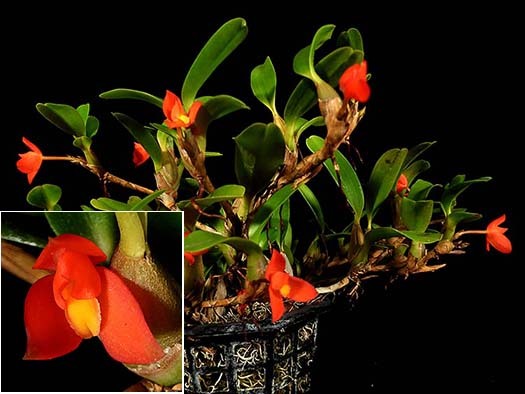 This terrestrial grows in tropical areas from Mexico to Ecuador, and the Caribbean. 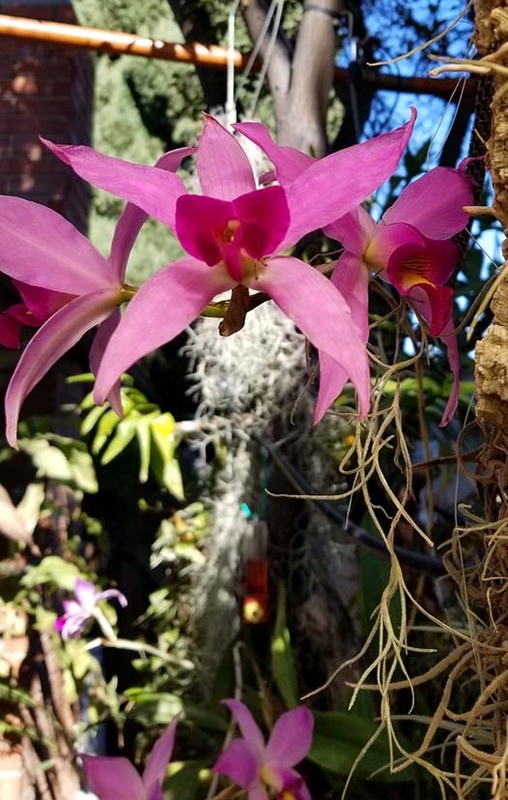 I grow it in the greenhouse, but it would make an excellent house plant. It doesn't need much light, and the foliage is very attractive. The green part of the leaves is almost velvety. The intensity of the spots seems to vary from year to year. Greenhouse. 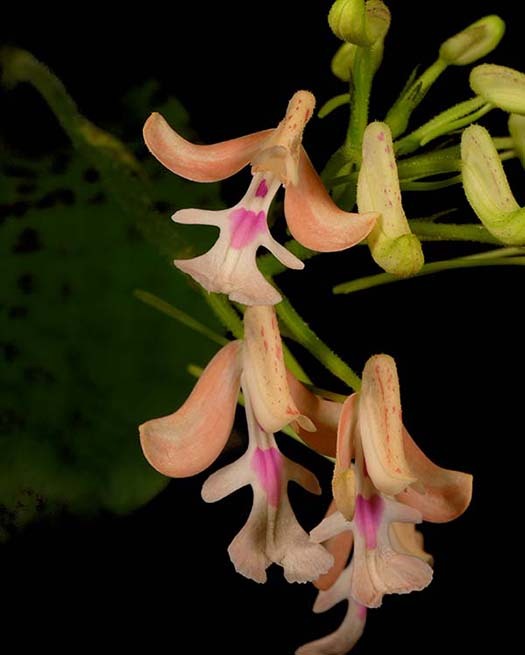 The flowers tend to hide among the leaves, are about 3/4 inch. This is as open as they get. The pollinator must be very tiny, and like enclosed spaces. 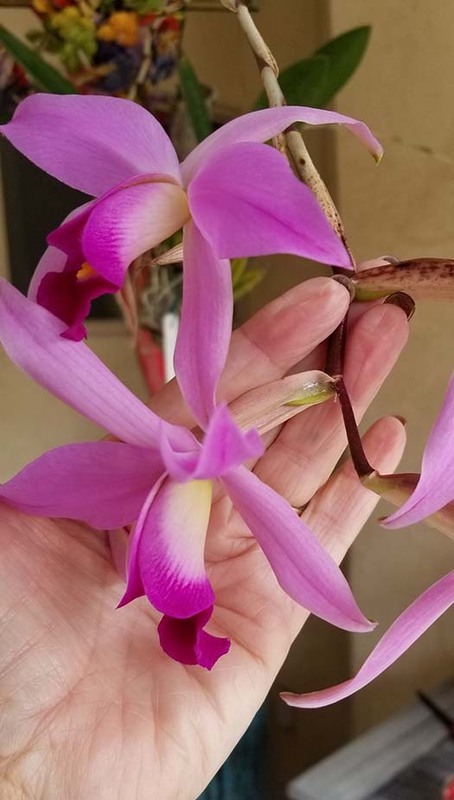 I got this as a dormant tuber from Madagascar last October. Kept dry, it should have stayed dormant until spring, blooming in June or July. However, it started to show its leaves, so I began watering. Clearly it has its seasons backwards. I hope that once it goes dormant, it will stay that way and flip its seasons for next year. 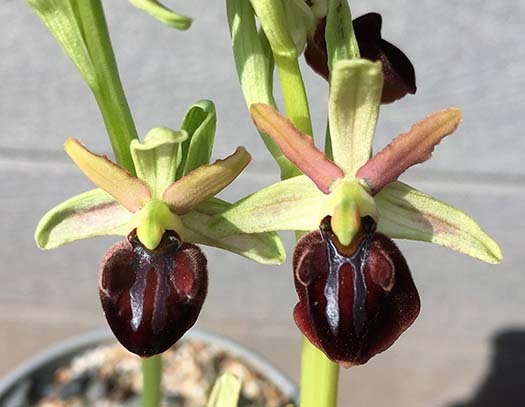 I'm not so sure that it really needs, or wants, to be without at least some water while dormant - I have observed at Andy's Orchids that dormant Cynorkis gibbosa plants get watered throughout the year. Also note that there is a lot of color variation in this species. This one is very light compared to some that I have seeen.